With just 20 shopping days left, we can all use a little inspiration in the gift giving department, regardless of who the intended recipient may be. Whether you are shopping for your mother/father, sister/brother or spouse, you can never go wrong with the timeless gift of jewelry. Instead of the generic gift card, head over to your local jewelry store to find irresistible pieces for the people who made it on your “nice list” this holiday season. If you cannot find that gift, the one that screams “choose me,” there is also custom jewelry design. Here are five gift giving ideas to help you with your holiday shopping. For the men in your life, we cannot think of anything more classic than a pair of cufflinks. Can you? Cufflinks can be worn with either single or double-backed cuffs, adding sophistication to every occasion. They are available in a wide range of materials, including gold, silver and everything in between. Precious stones, carbon fiber, and pearls can also be incorporated in their design. Gold and silver necklaces with simple pendants are extremely versatile. They can be worn for any occasion or with any outfit. The recipient can also easily mix them with other jewelry. Pearl necklaces are another must-have. A modern, yet elegant piece is the Y-necklace, which just so happens to be trending right now. Y-necklaces can be simple metal or crafted with precious stones. Drop earrings make for a great everyday look. They also transition well from the office to the night out. Drop earrings can be simple, crafted using only metal, or more substantial with diamond or gemstone accents. Another option for earrings are studs. Like drop earrings, studs can be designed with the giftee’s preferred materials (hint: check their jewelry box or look at photos) in mind. Simple rings make a great gift for virtually anyone. These rings are generally worn on the right-hand, so as not to be mistaken for an engagement ring or wedding band. Popular materials include yellow gold, rose gold, and sterling silver. Stackable rings are also fashionable. As their name implies, these rings can be mixed and matched, then layered one on top of the other for a stunning look. There is no hard-and-fast rule that says gift giving must be conventional. Custom jewelry is one-of-a-kind, making it an especially thoughtful gift for your special someone or parents. Choose from rings, earrings, necklaces or cufflinks and make them the receiver’s own through custom jewelry design. For a personalized touch, consider engraving a special message or their initials. Cornelis Hollander Jewelry has been in the business of making memories for more than 30 years. Our award-winning jewelry pieces are flawlessly engineered with bold, beautiful, sharp lines that the receiver of your gift giving this holiday season is sure to love. 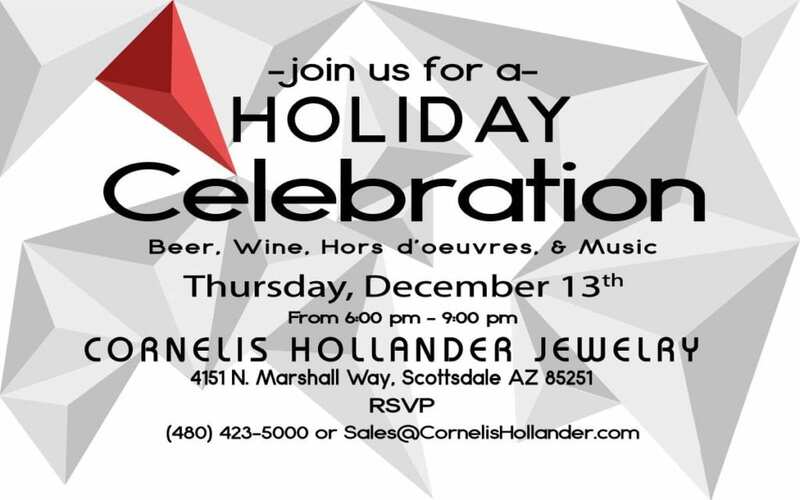 Schedule an appointment to speak with a Cornelis Hollander Jewelry Designer today at (480) 423-5000 or sales@cornelishollander.com. We would also like to extend an invitation to join us for our annual Holiday Celebration on the 13th of December from 6:00 to 9:00 PM. There will be drinks, food, music and jewelry. Join us in Downtown Scottsdale at 4151 N. Marshall Way, Scottsdale, 85251. We hope to see you there!